Dashing through the snow on an open sleigh is not just for Norman Rockwell paintings. Climb aboard a horse-drawn carriage on metal runners for a unique Park City escapade sure to engage the whole family. 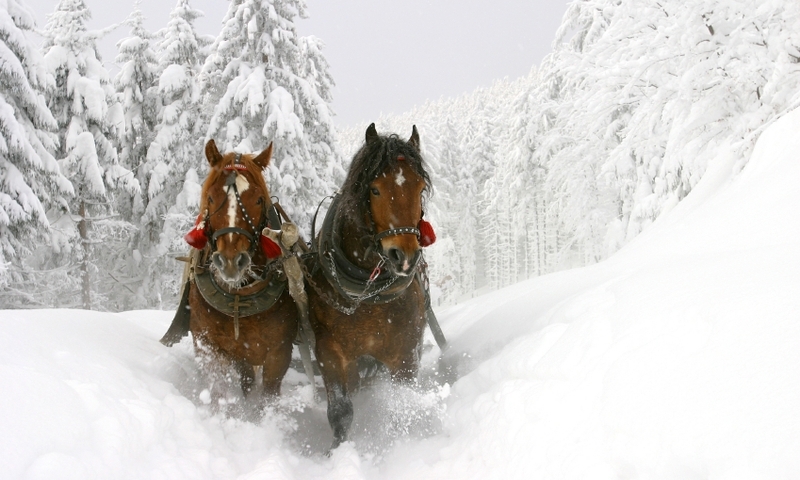 Snowed Inn Sleigh Company is located at the Park City Mountain Resort in Park City, offering horse-drawn sleigh rides with or without dinner. Horses don't smell pretty so sensitive noses beware. There's no way around it. Ask for a blanket if your outfitter doesn't offer you one and bring a knit hat. Five minutes in a open sleigh with the chill air on your face and legs is enough to make you want to crawl in front of a warm fire and end your ride. The horses won’t be the only mammals working up an appetite when you board a Park City sleigh. The cold winter air, the excitement of your first dash through a farm field or mountain valley, and the comraderie of your carriage companions will undoubtedly roust your appetite. Sleighs hold about 10-12 people. Rides themselves last from 20 to 30 minutes so dress warmly and get ready to make new friends. Most sleighrides in Summit County involve some sort of dining option. It’ll cost you more but it’s worth it to sit down to a hearty meal after a brisk nighttime ride. Most operations also have live music. Take a spin around Empire Canyon at Deer Valley; a figure eight at The Homestead Resort near Heber; or do an out-and-back to a cabin just above the base of Park City Mountain Resort. The sleigh companies usually run their operations on private ranches when they’re not based out of a ski resort. You’ll be away from highway sounds and the city lights as you jingle across foot bridges and alongside creeks.